The NRA is America’s preeminent gun rights organization, made up of nearly five million members. Together, we fight and win the toughest battles for the Second Amendment, all while offering the best firearms educational programs in the country. Every day, the NRA fights back against politicians, judges, and bureaucrats who want to regulate, restrict, and ultimately, destroy your Second Amendment freedom. That's why you need to join the NRA RIGHT NOW. What are the benefits of NRA membership? As an NRA member, you’ll get an official NRA membership card, a free NRA decal, and a free subscription to one of the NRA’s award-winning magazines. Plus, you’ll receive valuable NRA 5-Star Benefits that put hundreds of dollars back in your pocket! How much does it cost to join the NRA? Your one-year NRA membership is just $45 and unlocks all of NRA’s member benefits, giving you access to hundreds of dollars in savings. And if you’d like to save even more, choose a two-year membership for $75, a three-year membership for $100, or, for the best value, a five-year membership for only $150. How does the NRA use my membership dues? Your support will help us defend your Second Amendment freedom whenever and wherever it comes under attack. In addition, your membership dues will help the NRA cultivate the next generation of sportsmen and women through our youth firearms trainings…empower women with our self-defense programs…and support our police officers with our world-class law enforcement training programs. What is the NRA’s history? 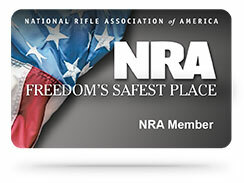 The National Rifle Association was founded in 1871 by U.S. Army veterans Col. William C. Church and Gen. George Wingate to “promote and encourage rifle shooting on a scientific basis.” In the following decades, the NRA has provided world-class firearms instruction to thousands of gun owners across the country. When anti-gun lobbyists and politicians began their war on the Second Amendment four decades ago, the NRA fought back. And over the years, we’ve defeated hundreds of attempts on the national, state and local levels to infringe on your Right to Keep and Bear Arms. Today, the NRA stands as America’s oldest civil rights organization. Every time there’s a threat to your gun rights, the NRA is there to defend your freedom. We also provide firearms training and gun safety programs to gun owners from all walks of life. NRA is fighting for our fundamental freedoms every day and I can't think of anything more important. This is why I renew my NRA membership every year. This country was founded on freedom. And now it’s my generation’s turn to defend it. That’s why I joined NRA. One person to a politician in Washington, D.C. is nothing. But together as members of the NRA, we have a voice. I’m proud to be a member of this organization.